To do one thing. And do that one thing to absolute perfection. That has always been a dream of mine. Alas, I am undisciplined. A dabbler — good at a few things but expert at none. Fortunately, here in Japan, I get to bask in the glory of folks way more disciplined than me, folks who have spent their lives doing that one thing, and doing it really really well. 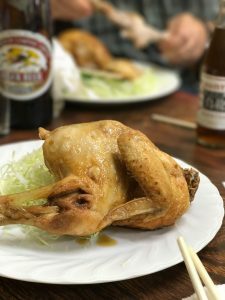 In a run-down arcade, a few steps from the Tateishi train station, whole half-chickens sizzle away in bubbling cauldrons of oil in the back of a tiny butcher shop open to the street. It is an irresistible sight. A stout middle-aged woman makes change and wraps the sizzling chickens in butcher paper for to-go orders. Behind her, the chef — towel tied round his head — is armed with two large forks. Placid, grizzled, of indeterminate age, he maneuvers those half-chickens like a painter. Not a movement is wasted, not a hint of boredom shows as he cooks one bird after the other, day-after-day — each one delivered at the perfect moment, skin crackling and juices bubbling. 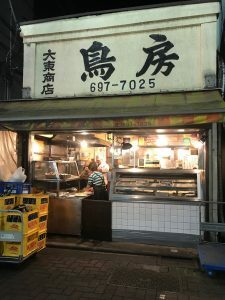 Behind the shop itself, with an entrance in the alleyway, is Torifusa, a tiny izakaya serving his chicken alongside bottles of beer. There is always a line. A long, slowly moving line. Peaking in through the curtains, you can see a tightly packed crowd — half seated on the floor, half at the counter — ripping apart these golden chickens, juices running down their chins and swallowing bottle after bottle of frosty Kirin. The alleyway sits at the entrance to “Drunkard’s Street” (announced by an actual sign!) which is a warren of zinc pan shacks containing fetid toilets, Yakitori spots and tiny izakayas which open early and celebrate Tateishi’s claim as the Mecca of Tokyo drinking. The whole area is slated for destruction in the next year or so. There is a hand-written sign at Torifusa’s entrance saying that they will not serve drunks. I have wanted to go since the first time I saw those bubbling chickens, but the timing never quite worked out. This time I got lucky. The line was only 4 deep, my family and I were hungry and I was ready. The interior of Torfusa is neat but ugly like a Communist-Era Czech train station in some far-off country town. The florescent lights burn bright, the beige wallpaper is depressing and the cushions are worn. The waitresses are all older women, jolly but harsh — accusing customers of being drunk (“No! No!” shouted one accussed guy, “I just have a naturally red face!”), admonishing people for not drinking beer (“This isn’t a cafe!) and showing the proper way to eat such a large piece of chicken with no knife and fork (crack the bones and pull apart!). People come in through the curtained doorway as if they have gained admittance to the Pope: they look around in wonder, grateful to finally have access. There are pickles, and a couple a different chicken sashimi dishes (in mayonaise, in miso and with soy) but really there is just the chicken. You are not allowed to share. You have to order a whole piece for yourself. There are 3 sizes ranging from $6 to $8. I got the smallest size and after a long wait, was presented with a golden half bird, as big as the plate, still sizzling from the oil and served over shredded cabbage and one sad leaf of curly parsley. This is not breaded, battered or even marinated chicken. This is simply seasoned and cooked whole. The skin crackled under my teeth, the flesh juicy with rendered chicken fat. From drumstick to breast, the meat was tender, perfectly seasoned with the vague gaminess of chickens raised far from a factory farm. One of the waitresses told me to eat the backbone, the small rib bones, the end of the wings as the frying had rendered them crunchy and edible. The cabbage soaked up the juices. In silence, in a type of reverence, my family and I ate. My wife is not a huge eater — or rather she can eat a lot all day, but never all at once. At Torifusa, she finished before me, lifted that sad piece of parsley to her mouth and presented a plate stripped bare, a small pile of bones left to tell the tale. Only in Jamaica, have I seen a plate of chicken so decimated, bones cracked and sucked for marrow, flesh stripped with nary a tendon or speck of cartilage left for the rats. “I am going to dream about this chicken,” she announced. You can’t cook a half a chicken like this at home. You could trick yourself and think it all looked simple and completely fail. Your chicken would be greasy, the breast meat juicy, the drumstick raw. Or maybe it would be the other way round, dry, tough breast meat and tender thigh. Or maybe all the meat would be cooked properly but the skin would never crisp so perfectly, the bones would never crunch like a cracker. Finally, you could do everything right and still when you would take your first bite, be disappointed. To understand this dish, you have to look at the chef. You have to bear witness to the endless repetition year-after-year of plunging that huge bird in sizzling oil and knowing just when to turn it, rotate it, switch cauldrons — you have to recognize all that he is aware of: the change in smell as the bird fries, the feel of forks in flesh, the subtle changes in the skin coloration that finally determine when the chicken is done. Not to mention, the hidden supplier that has been bringing him the finest poultry for the past 60 years. I can not rightfully say that there is love in each chicken that gets plated at Torifusa, but there is the steely determination that each plate is as good as it could be. Soon, those years at the cauldron will be for naught. The city planners of Tokyo will cordon off the Tateishi streets and the wrecking balls will begin to swing. The drunks will no longer stagger out of the alleys begging to be let into Torifusa. A gleaming tower will rise, the crowds will buy karage from 7-11 and the un-named chef will retire to Okinawa, play pachinko and those sizzling chickens will live on, only as a dream. Wonderful writing. As tasty as the chicken.